This comprehensive book on developing Unity 3D games for the iOS family of mobile devices – iPhone, iPad – covers all the considerations when developing mobile games and demonstrates the concepts using practical tips, scripts, shaders, and projects. Available as book and ebook. Unity iOS Essentials takes you through all aspects of Unity 3D game development for iOS. Mobile game development means thinking about mobile performance, multiple device screen resolutions, deploying a single application to multiple devices, understanding .NET integration, taking advantage of advanced lighting and culling systems, and integrating a mobile game with a server back end. 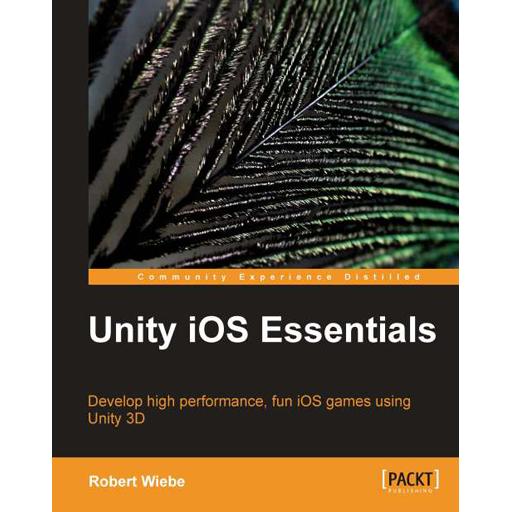 This comprehensive book on developing Unity 3D games for iOS covers it all and demonstrates the concepts using practical tips, scripts, shaders, and projects. Learn how to plan for supporting multiple iOS devices before you start writing your first script. Consider performance and advanced game topics that will speed up your game development while solving real world problems. Build with projects that deal with real issues. Unity iOS Essentials provides you with a fully illustrated and fully commented step-by-step guide for realizing your game idea using advanced concepts that work on the iOS family – iPhone, iPad – of mobile devices.